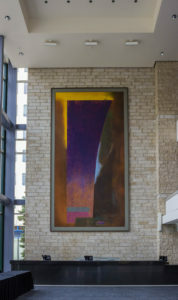 At two stories tall, this massive painting greets visitors entering the lobby or mingling during intermission. Although he retired from the University of Alberta’s Department of Art and Design in 2003, Darrah continues to actively produce and sell new work today. Artist Statement: In 1997, I moved my home and studio from the city of Edmonton to an acreage in Mulhurst Bay. This move, in conjunction with preparations for an exhibition in Greece, and the recent death of my mother, brought about significant changes in my approach and practice. I had begun to allow the things in my immediate environment that I habitually looked at with fondness, to have a greater presence in my paintings. Some of these drawings subsequently led to and some were incorporated into a painting based on this wonderful ceramic. So, some of my paintings, when derived from a very rich and resonant source, are a way of bringing in my experience to the essence of the subject. Later the painting process digests the literal and my personal abstract language takes over.